I’ve mentioned here before that when I was in high school and college I wrote pretty prolifically. Not great fiction, but plenty of short stories and most of a novel. I submitted one story in high school, got a half-page rejection (Asimov’s, I think? I can’t find it) and more or less kept my stories to myself and my friends after that. I stopped writing fiction in grad school — academic papers and lack of free time killed that as a hobby. I started writing again seriously two years ago, and looked at what it took to get published. I read a lot online, tried out online workshops, and tentatively submitted my novella-length story. I told myself that I expected a rejection, but I didn’t really believe it. Secretly, I knew that this (very long, off-genre story) was a work of genius and that it would be snapped up by the very first people I sent it to. Oops. It took a while to build my confidence up again. I wrote three or four more stories, and took the feedback on them much more seriously. One of those stories I sent to Viable Paradise (still open for submissions for 2011!) as my submission piece. And after much hemming and hawing, on April 11th last year I started submitting again to pro markets. Let’s have a look at the results, courtesy of Duotrope, shall we? I’ve cut out the names of the pieces on submission and the markets for the sake of a modicum of professionalism (Oh no, dear editor, you’re the first one to see this story. Honest, there’s nobody else but you in this story’s life.) If you’re deathly curious I’ll send you a copy with the relevant columns included. Also, if you’re not a Duotrope user, a quick explanation: the first (optional) box shows whether I have a note for that submission. The second box with either an “e” or a “P” refers to electronic vs. postal submission. The third box, with either a check or an “x” indicates whether simultaneous submissions are allowed (that is, while that submission was open, was I free to send it somewhere else?) and the fourth, optional, checkbox indicated whether I got an acknowledgement of receipt from that market before getting the response. 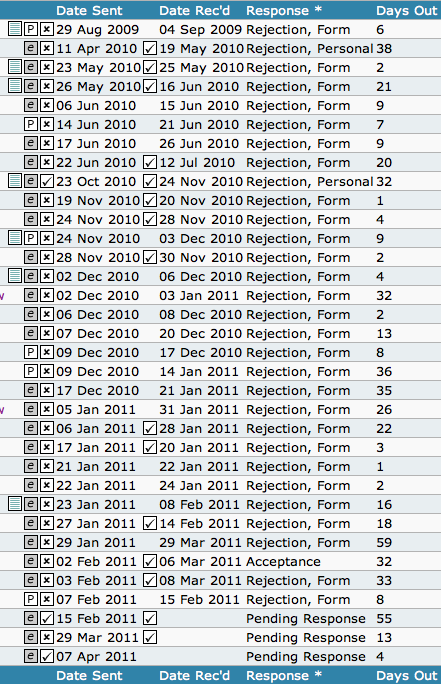 So, that’s 33 submissions since this time last year: 29 rejections, 1 acceptance, 3 still out. Seven unique pieces, fourteen unique markets. There’s a long dry spell last summer: After getting into VP, I decided to hold off, and revise my stories according to what I learned there. I’ve also had a bit of a dry spell this spring while the worst of the kitchen renovations have taken place. If I’d shown the title listings, you’d notice that I’ve retired a few pieces and haven’t submitted anything new since January. Finally, I’m waiting longer for responses as time goes on. This is primarily because I tend to send first to markets with short response times, but in at least some cases I think my stories are getting further into the selection process before being rejected. I don’t want to speculate further than that, lest I get mired in rejectomancy. On the whole it’s neither a good nor a bad sign, just proof that I should get more stories out on the market. Anyway, that’s my year in submissions. Hopefully next year I’ll have more: more stories, more submissions and (dare I say it) a few more acceptances. Posted in Business, Writing.Tagged business, markets, short story, slog, writing. This is so inspiring! Thank you for sharing. Nice job getting those submissions out and not falling victim to rejectomancy! Thanks! Congrats on the Allegory acceptance, BTW.